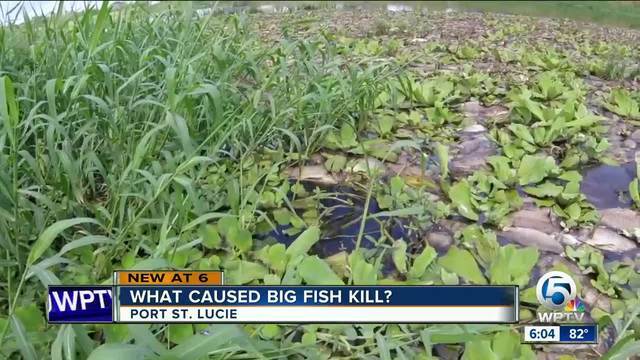 The Florida Fish and Wildlife Conservation Commission is investigating a dramatic fish kill on the Treasure Coast. The dead fish isn't the only concern neighbours must deal with. The biggest and most immediate issue is the horrible smell. The dead fish are in the C-24 Canal east of Port St. Lucie Blvd. The canal ultimately leads into the North Fork of the St. Lucie River. Right now, most people want to know what caused it and who's in charge of cleaning it up? "It's hard to live here now," said Miguel Gonzalez who lives on Dalton Circle alongside the canal. "Sometimes, it smells inside the house." He now walks around his neighbourhood with Vicks Vaporub and a towel to block the smell. "I take my little dog outside and it's hard to be outside." For at least 6 days now, he's been dealing with the deadly odour. "Somebody's got to come in." At this point, FWC would only say it is looking into the fish kill. However, something like this can happen after a major storm like Irma, when there is a sudden runoff. "What you're seeing is a fish kill usually caused by a deprivation of oxygen in the water," said Mark Perry with Florida's Oceanographic Society. Perry says while this can happen after a storm, it doesn't happen after every storm. So it's important to get to the bottom it. "We have to be careful not to assess to quickly. It could be a chemical situation. It could be some pesticide or something in the water which causes the fish to die like that in mass numbers. That's a very big fish kill." It's important to note, the C24 canal does not get water from Lake Okeechobee.